Painting Acrylic on Canvas | 16" x 18"
Painting Acrylic on Canvas | 24" x 32"
Painting Acrylic on Canvas | 23" x 26"
Painting Acrylic on Canvas | 26" x 32"
Painting Acrylic on Canvas | 28" x 23"
Painting Acrylic on Canvas | 30" x 38"
I am inspired by the ancient tales of Gods, the liveliness of folklore, the innocence of animals, the beauty of nature and the emotions of humans. Bright, bold, vivid, vibrant and captivating colours in my paintings indicate the happy and lively feeling that bubbles through me when I paint. My work aims to mesmerize the viewer and transport them to the core of the story behind the picture. Shyam Sundar P. Achary completed his Bachelor's degree in Fine Art from BK college of Art and Crafts, Bhubaneswar. The artist is famous for his acrylic paintings on canvas that are majorly figurative in nature. 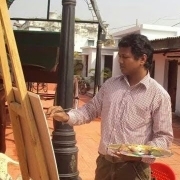 He has received several awards and recognition for his paintings on different occasions such as the 15th National Youth Festival, Young Artist Camp, Orissa (2010) and National Young Artist Camp, Jharkhand (2004).